"A subtly uplifting release exploring the potential of a combination of instruments that, although not unprecedented, is still something of a rarity." "This absorbing collaboration...is exotic, atmospheric and appealingly multi-textured, and should be required listening for open-minded music lovers everywhere." 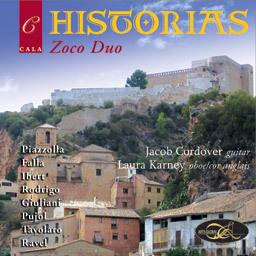 The evocative and romantic combination of guitar and oboe/cor anglais meet the equally evocative music of Spain, Italy, France and Latin America, in a program full of Mediterranean and Latin passion.